Cut-Out Sugar Cookies — urban. apron. Each year, as the Christmas season comes around, I'm rolling out sugar cookies at least once...or twice. When I'm at home, making Christmas cookies usually involves whichever family members I can round up to help decorate...which usually ends up being my sister Sarah and me decorating the cookies as the rest enjoy the results. And the past few years, my nieces have come into the picture, helping roll out the dough and decorating the cooled cookies. Decorating cookies has become a tradition I look forward to every year. Because no matter what - it's always fun, messy and sweet. You can't worry about getting flour all over or making a mess. These are memories you are forming, flour and all (and it only comes around a few times a year!). It's time to cherish it! 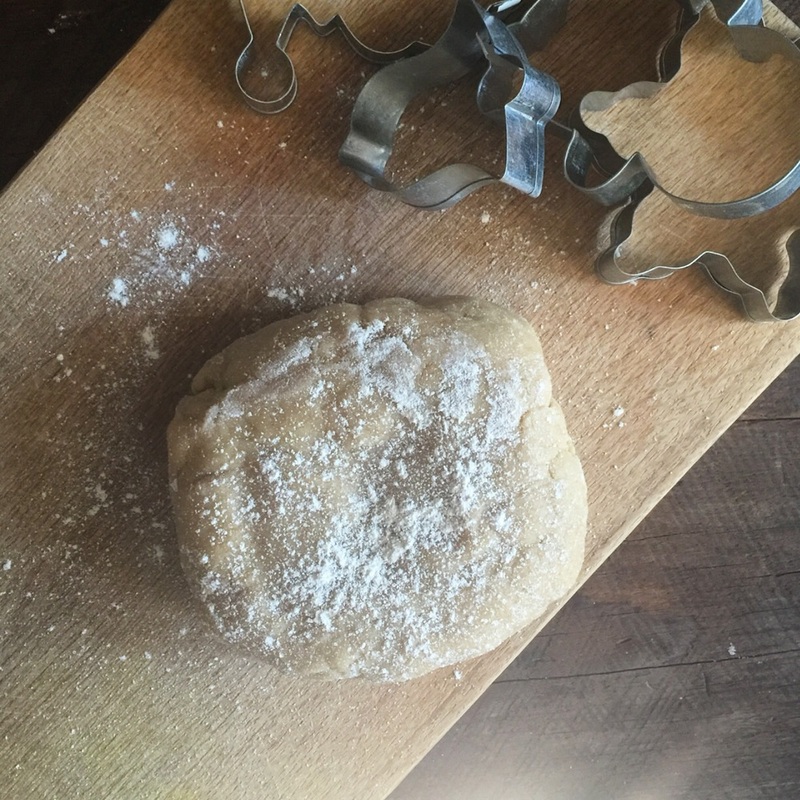 This is my go-to recipe for cut-out sugar cookies. I can't ever seem to stray from it. I recommend adding it to your holiday recipe arsenal! In a mixer, cream the butter and sugar together until light and fluffy. Add in the vanilla and egg and mix to combine. In a medium bowl, whisk the flour with the salt and baking powder. Gradually add to the butter mixture, beating to combined. Add in the milk, 1 tablespoon at a time. You may need add more milk if the mixture is too dry. Form the dough into a flattened disk and wrap in plastic wrap. Refrigerate 1 hour. When you are ready to make the cookies, sprinkle flour on a clean work surface. Flour the rolling pin and roll out the dough to about 1/4 inch thick. Cut out desired shapes and place on a cookie sheet lined with parchment paper. Bake about 9 minutes, or until edge are juuust about to turn golden brown (but not yet golden brown!) Take them out and let them cool 5 minutes on the sheet and transfer to a wire rack. Over-baking these cookies will create a crunchier cookie. Taking them out before golden will ensure these are nice and soft! Cream together the butter and vanilla until fluffy and creamy. Add in slowly the powdered sugar, little by little. You can start adding in the milk as you alternate adding in the sugar. Beat until becomes a fluffy icing - a few minutes. Divide into bowls and color with desired food coloring. To decorate: Use a pastry bag or Ziploc with a corner cut off, and spoon icing in the bag and pipe onto the cookies. But, for an easy trick to get beautiful cookie-decorating results, I recommend placing the icing into plastic Ziploc bags and snipping off one corner. Then, just pipe the desired design onto the cookies.